Since 1638 we've been at the heart of Exeter. Steeped in history. Relevant for today. Looking towards the future. In 1638 the Rev. 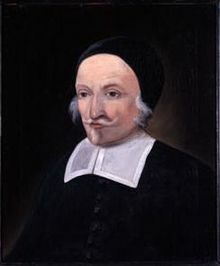 John Wheelwright had been exiled from the Massachusetts Bay Colony for preaching too much about God’s grace. Forced north, he led a small band of followers north into the New Hampshire wilderness and settled on the banks of the Squamscott River. The community that emerged there became Exeter, New Hampshire, and in those days every New England town had to have a church in order to receive a charter. So from the very beginning, the heart of Exeter was Rev. Wheelwright’s church. Over 375 years later that same church is still at the heart of Exeter, and is now known as The Congregational Church in Exeter (UCC). If you drive down Front Street you’ll see the large white church with the three red front doors. Our current building dates from 1798, and is our fifth meeting house. Inside the doors of those church buildings the story of Exeter, and of our country, has unfolded. This church has seen the call for American independence and the Revolutionary War. Later generations were early proponents of abolition, and supported the Union during the Civil War. (During a period when the congregation was temporarily split into two, and First and Second Parishes, Abraham Lincoln worshipped in Second Parish prior to becoming President.) In the Twentieth Century members responded to the news of the day, and lended support to those seeking justice. In one instance the congregation sent its pastor to Selma, Alabama to march for equality with Dr. Martin Luther King. Today we still strive to live our faith by doing the right thing. Over twenty years ago we became one of the first churches in the state to declare that we were Open and Affirming of all, including all sexual orientations and gender identities. More recently we became an Eco-Covenant church, committed to caring for God’s creation. We also cherish our affiliation with our national denomination, the United Church of Christ, or UCC. The UCC was formed in 1957 through a merger of earlier denominations, including the Congregational Church. Our name, The Congregational Church in Exeter (UCC), reflects both our heritage and our commitments for the future. The story of the Congregational Church in Exeter spans centuries, but we see it as just the start. We plan to be at the heart of Exeter for generations to come, because God has much more for us to do! The truly great news is that our story can be your story too. Come and join us, and we will write the next chapter together.